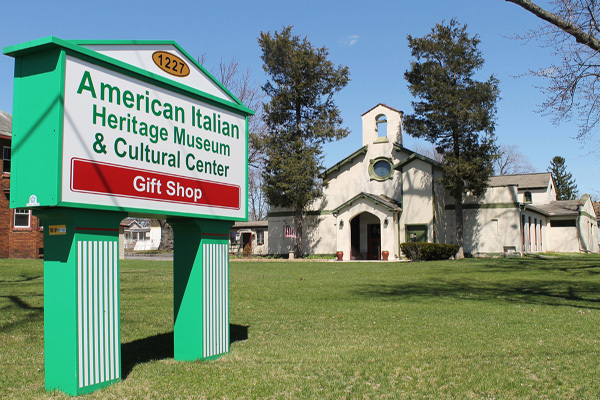 The American Italian Museum and Cultural Center is located in the town of Colonie the county of Albany NY. We are 4.5 miles east of the Albany NY International Airport, 162 miles North from New York City, 173 miles West of Boston, 283 miles East of Buffalo and approximately 180 miles south of the Canadian border. Merge onto I-90 E via EXIT 24 on the LEFT toward I-87 N / ALBANY / MONTREAL (Portions toll). Merge onto I-87 N via EXIT 1N toward ALBANY INT'L AIRPORT / MONTREAL. Take the RT-5 E / WOLF RD exit- EXIT 2E- toward ALBANY. Turn SLIGHT RIGHT onto NY-5 / CENTRAL AVE. Merge onto I-90 W via EXIT B1 toward RT-9 / ALBANY / HUDSON (Portions toll). Take the EVERETT RD exit- EXIT 5. Turn LEFT onto EVERETT RD. Turn RIGHT onto NY-5 / CENTRAL AVE. Merge onto NEW YORK STATE THRUWAY N / I-87 N toward ALBANY (Portions toll). Merge onto I-87 N / I-90 E via EXIT 24 toward ALBANY / MONTREAL(Portions toll). January 1st to March 31st the museum will only be open on Friday 11am-2pm. & Saturday. from 1pm to 4 pm and by appointment. 518 435-1979 to see if the museum is closed due to the weather! We are just a short distance to nearby hotels, restaurants and shopping malls .